Pura Ultraviolet water filters are a safe, clean, easy-to-maintain method of assuring that your home's water is free of bacteria. Ultraviolet filtration is a proven technology that has no significant drawbacks. The low operating cost of uv treatment, quickly pays for itself. It is environmentally friendly and essentially trouble-free. Pura UV Filtration is available in small under the sink systems for kitchen use to small and large home in-line filters. Any Pura system is ideal for disinfecting your well/city/municipal drinking water. The PURA® ABUV Series is an advanced Ultraviolet Water Disinfection System. It has been designed with you, the consumer, in mind. The system will provide you with disinfected drinking water for years to come. These systems have been designed with high quality construction and innovative features. Disinfection of water using ultraviolet light at a wavelength at 254nm is a chemical free way of destroying the DNA of microorganisms rendering them unable to replicate or cause infection. The axial flow chamber design of the PURA® Stainless Steel Series, utilizes the energy from the Ultraviolet Lamp evenly across the water flow. Installation of the system is straight forward and simple. Maintenance includes changing the lamp once a year and cleaning the quartz sleeve periodically. The PURA® BUV models are tested and certified by NSF against Standard 55 for Class B disinfection. The Pura UV "ADD-ON" series is designed to be an easy addition to water treatment systems that require ultraviolet disinfection such as RO systems, holding tanks, water dispensers, recirculating systems, etc. They are available with a 1 or 3 gpm flow rate and are constructed using a 304 stainless steel body and a molded head with 3/8" John Guest fittings. The Pura UV-1 EPCB is a unique unit that consists of a single slimline housing that holds a UV lamp inside Pura’s exclusive extended pass 0.5 micron carbon block filter. It’s a great single-pass treatment for removal of bacteria and cysts as well as chemical contaminants. The other undersink filters are part of the two gallon per minute UVB series. UVBs use heavier vessels and feature the combination of sediment and carbon filtration as well as ultraviolet purification. The UV20 Series consists of three units that are ideal for most residential applications. 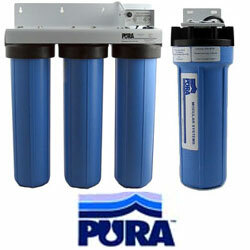 This series uses Pura’s #20 lamp and standard-sized 2.5" X 20" filter cartridges. This makes replacement cartridges easy to find. These are good, free-flowing units that handle up to ten gallons per minute of flow. Port size of all vessels is 3/4", allowing for more than adequate flow rates for most homes. Big Boy units use standard-sized high flow vessels that are capable of treating up to 15 gallons per minute. These units are built with full-flow double-sized vessels and accept 4.5" X 20" cartridges and can be purchased as UV lamp only or lamp with sediment and/or carbon block filter. Big Boy units come with 1.5" ports. These are tough, heavy duty units built to deliver very clean, bacteria-free water. Available in single, double, and triple formats with UV only (single), UV plus sediment (double), and UV plus sediment and carbon block (triple).